If you’re a fan of Japanese anime, you surely have already seen these badass characters with their weird permed hair dyed in orange, wearing strange school uniforms that stand out from the rest, and speaking like a boss who always seems like they are looking for a fight. Say, for example, Eikichi Onizuka from Great Teacher Onizuka; a badass indeed. Most of them usually comes in groups like the students of Yankumi from Gokusen with their leader as Shin, or Hanamichi Sakuragi with his sidekicks who also used to be deadbeats before joining the basketball team in SlamDunk. Turns out, these men actually existed, or are still existing, in the real world. SO who exactly are these people? They are the Yanki. 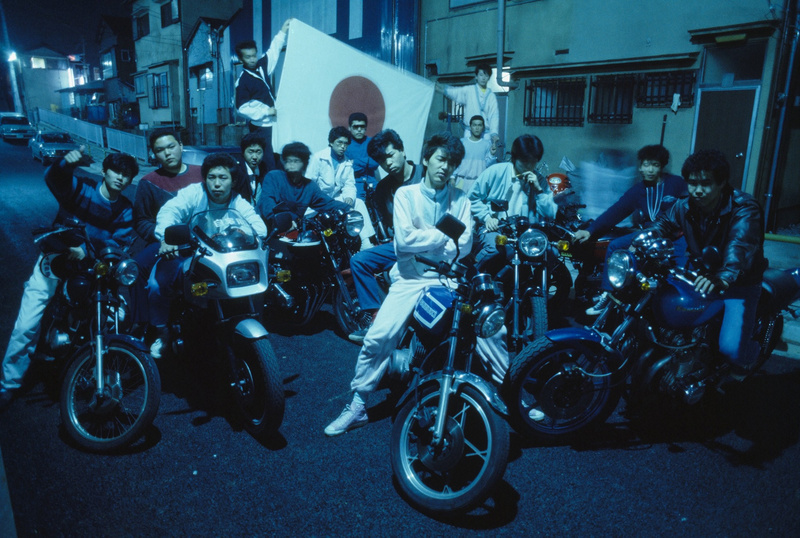 Yanki is a Japanese subculture which was popular in the 80′s and 90′s. It was the style of delinquent students. They refuse to take part in the strict manners of Japanese culture. They are the closest thing to the white trash of the West. There is no legit explanation as to where they got their names, however, some say that they got their origin from American “Yankees”. Just as I said in the earlier part of this article, these people have a distinct fashion style that makes them a Yanki. Aside from things mentioned above, they are often seen with excessive piercings and jewelry, jackets worn over their shoulders, wooden sandals or geta, and more. They often roam around the city on their big load bikes and gather in large numbers. But one recognizable habit of Yanki is the Yanki-zuwari. This trademark manner of sitting wasn’t exactly polite but this style of sitting enabled them to cop a squat anywhere and rest their elbows on their knees with their crotch wide open while puffing on cigarettes. Yanki zuwari made people look like they were going number two, hence the other name for that style of sitting is “unko zuwari” or literally “poop sitting”, because it mimics the squatting style used with traditional Japanese toilets. But being a Yanki isn’t just all about fashion and fame. Just like in some modern “fraternity” and “sorority” groups, at least in the Philippines, it is a hierarchy. Younger Yanki are expected to speak to the senpai in keigo (polite speech), run their errands and do whatever they are told to do. All this must be done with the three pillars of yanki behavior namely: konjyou (guts), seii (sincerity) and nyukon (dedication of the soul). If Japanese people who follow the norm of the society start thinking about marriage by their late 20′s or 30′s, Yanki are know to go for early marriage. Most of m finish raising their kids by 35. A true yanki will drop out of school by the age of 17 and become parents. In fact, when the local seijinshiki (Coming of Age) takes place by the time they are 20, they often show up with young children. Yanki girls who got pregnant become Yanki-mamas or yan-mama. And yanki dad’s get busy into personally customizing their car bought from the money they got from work which is likely to in construction sites or in workplaces where manpower is needed. Although many of them are expected to end up as one, only some yanki pursue their coolness and level it up into being a yakuza, a Japanese mafia. The number of people who are over 60 years old is now increasing in Japan. Many of them want to maintain their health as long as possible. It has become common knowledge that people should take nutritional supplement or go to a fitness gym to work out once or twice a week to keep healthy. The average age of the gym users seem to rise each year as most users found in many fitness gyms may range between 65 and 70 years old. Have nothing must to do at home… it is fun to take a bath in a large bathroom at gyms than a tiny bathroom at home… Monthly fee allows the gym members to use the facility as many times as they want. If the fee does not correlate with the visit, it is natural that more and more people find it beneficial to spend their time in gyms three or four times a week. Compared to the conventional gym practice, Curves has a very unique concept. Have you ever seen or heard of a fitness club, Curves targeting specifically and only at women and providing only 30 minutes of workout in one session? Currently, the company has spread throughout Japan having the gym studio at almost 1700 locations. At first when you hear 30 minutes workout, you may well doubt what can be done in such a short time. You might even think that preliminary stretches may take up the time. But you are wrong. You will realize this actually works just fine if you try. 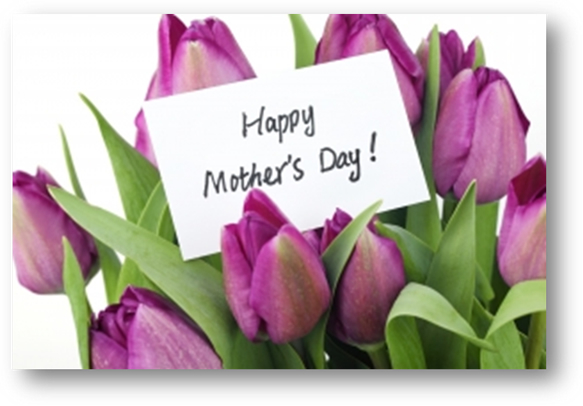 The founder is Dr. Gary Heavin who lost his mother suddenly by high blood pressure, depression and obesity. He went to a medical school and developed a fitness club based on the kinesiology. At first, only young women gathered against his will. He then learned nutritional science and opened Curves targeting at women in middle-age and older. In a small room of 36m2 twelve different kinds of machine are lined in a circle so people exercise facing each other. You use each machine one after another. After 45-second exercise, you get off the machine and stamp for another 45 seconds. Then back to the next machine and so on. For people in their ages, if you force too much, you get injured. Curves-style exercise stops just before the point when people feel forced. This is completely opposite from the concept that conventional fitness gyms have. This much of exercise is just enough so you don’t feel tired when you get home. Because it is such a short time, this exercise does not bother your other routine work. Lastly, since you are not forcing yourself, you can keep up doing it long. It is no surprise that this idea came from American not from Japanese to come up with the opposite style from the regular fitness sports gym. About 40 years ago, I conducted a basic research with my friend, Shizuo Wada how a 15-minute exercise once a week could lose weight. He was the founder of Wada Laboratory that hosts Japan Beauty Contest. He also verified whether each exercise was effective or not by checking pulse. His workout program consisted of 6 or 7 types of exercise for both upper and lower parts of body in one session. What was different from Curves was to exercise along the pitch of your breathing but when you exhaled out completely, you still needed to hold for 5 to 10 more seconds. That was the main key point. When you breathe out during the anaerobic respiration, lactic acid builds up in the muscle where load being applied, which stimulates and generates new muscle. When the fat mass around muscle breaks down, it generates energy. This energy builds new muscle cells. Mr. Wada back then had an inspiration and came up with a diet method of high-protein and low-carbohydrate foods. He was the very first person who conducted this low-carbo-diet, which is now very popular. It was perhaps during 1980s when Dr. Atkins started the low-carbo-diet in America so I am pretty sure Mr. Wada’s finding came to light way earlier. In other words, Mr. Wada came up with this diet idea first than anybody in the world. Mr. Wada and Curves share the common point that short-time workout has been verified effective. Exercise is surely inevitable in upcoming era of an aging society, but it should also be obtainable reasonably. Chances and places to exercise should be reachable in any neighborhoods. Never force too much to workout. These are very important factors. Curves, meeting those conditions, will surely increase. Women considered to live 10 years longer than men should train their bodies, bones and make it habit to go out several times a week. Increasing the oxygen consumption by exercise and simple but routine workout are the best for preventing dementia and fractures in elderly people. I don’t particularly support any business but Curves is exceptional. I believe Curves is great. Lastly but not the least, staff of Curves call their members by their first names instead of last names. Women who have been called not even by their last names but in impersonal manners such as “ma’am” or “someone’s mom/grandma” for a long time, will feel happy when they were called in a way back in younger days, “Hi, Sachiko-san!” I believe the Curve-manner has a great effect on anti-aging. Without much thought, I picked up a book, “Miracles of ‘Thank You’ That Pleases Daichi” in a book store and read it through that night. The author, Mr. Murakami quit his job in 1997 and started farming by Toya-ko Lake in Hokkaido. His son, Daichi passed away at the age of four. Mr. Murakami started to come up with new farming techniques as if he were guided by the tragedy of his son’s death. Consequently, Mr. Murakami determined to become helpful to others and that encouraged him to reach a new farming technique that does not use agricultural chemicals or artificial fertilizers. The new farming technique is to say “Thank You” to everyone and everything around him at all times, from morning till night. Mr. Murakami never failed to say “Thank You” to vegetables he harvests, farm machine and equipment he uses and his family member who farms together. Ever since he read in some articles that saying “Thank you” for 360,000 times can make miracles happen, he made up his mind to carry this through. In fact, he had been depressed for 5 years until he came up with the “Thank You” farming technique. He did not say “Thank You” at all, not even once. As he started to say “Thank You” out loud, his life started to turn around 180 degrees as well. The more he said “Thank You” to his family and also to his tractor day after day, the more remarkable the miracles have become. One day, his lettuce became quite a topic in a supermarket that it does not get rotten like others. People wanted to know the secrete tricks, which were hard to be understood by the local agricultural cooperative association. Mr. Murakami repeatedly said “Thank You,” that was all; “Thank You” to the earth, microorganism and even to worms or often-called vermin because they eat the harvests. What makes Mr. Murakami appraisable is that he is grateful for a putrefactive bacteria that is usually an enemy to farmers because it causes weeds or crops to decompose. He considered that increase of putrefactive bacteria is a message that something is lacking. He also carefully examine a piece of weed for its ecology to understand. This is incredible. Weeds are typically considered harmful to vegetables and wiped out by chemicals. This is nothing unusual measure against weeds among farmers or anyone related to farming throughout the world. It is amazing that he managed to get an insight that weeds are a lump of natural healing power. They grow in the very spot where they need to compensate the soil for insufficient nutrients. For example, Mr. Murakami grows cabbage in one corner of the field and potatoes right next to it. Cabbage absorbs calcium from the soil completely. After the harvest with the soil lacking of calcium, plants such as fat hen or pigweed start to come out. You may be surprise to know those weeds synthesize calcium. Instead of pulling out to dispose, if you keep those weeds, they will naturally make up for the lost calcium. Potatoes, on the other hand, do not absorb much soil nutrients so the harvested soil is left with excess nutrition. In such soil conditions, the gramineous plant like millet grow and take up the excess nutrition that left behind. Mr. Murakami discovered that the earth improves its soil conditions by itself. His book is full of the true essence of nature that has never been addressed. I highly recommend to read this wonderful book. I think we’ve come to a point we should be aware that there are no such thing to call enemy in the nature. The 40th Japan Academy, the best film for Animation of the Year was awarded to “In This Corner of the World.” I bet whoever was watching the ceremony on TV like me must be surprised to know the winner because one of the candidates included “Your Name,” the animation film which made a huge hit all over the world last year. I did not know much about this winning film, so I rushed to a movie theater to watch “In This Corner of the World” the next day. The film-making project started by making a sample promotion film for the first 6 years. The team used a cloud funding, a new grass-roots movement to save an initial money of 20 million yen. After putting pieces of tiny effort together, the project ended up being a big success as a motion picture so as to draw lots of audience because it made them impressed. I think it has a significant meaning that this film was supported by so many people this year, in 2017. The movie focuses on a new young wife, Suzu, who is cheerful and dreamily but lives bravely. Her everyday life is so charming that it makes audience laugh and draws tears. This movie is dealing with a depressing theme and yet it shows what it’s like to be living during a war in such a manner that those who don’t feel like watching, so-called, ‘war movies’ can still take it in. I felt relieved at the last scene of the movie where it focused on Suzu who determined to survive the postwar life cheerfully and bravely as she also determined to keep a good relationship with her family and kind people around her. Above of all, this movie described in fine detail how happily and actively the local people used to spend each day in Hiroshima before the atomic bomb was dropped. It was completely different from the present landscape of Hiroshima, where the Atomic Bomb Dome stands lonely. The fact that Hiroshima used to be so full of life and animated place touches the heart of audience. The fact includes the beauty of Hiroshima before it burnt down that no one has never talked out loud. Precise and enormous historical investigation enabled to reproduce the warmth of people and their happy life. I cannot help admiring so much effort that the team had invested. If you watch this movie again and again, I became to realize some tragedies are hidden in the movie. As we look into what lies behind the scenes, we tend to find something more significant. This movie, “In This Corner of This World” and its original work in three comic books are both worth watching and reading. I sincerely recommend this movie so many people will have chance to know what was normal during the war time that we did not know. For some reasons or other, though I do not care much for so-called violent movies like “Outrage” directed by Takeshi Kitano, I ended up in watching this Korean movie, “Asura.” This may be because there are many great aspects of Korean movies. First of all, great quality of motion pictures. The four main actors play their roles with very unique, well-honed talents. They act tremendously well. I even wonder if we have any great actors like them in Japan. This movie depicts dirty human relationships that are intricately intertwined among the four main characters: a corrupted mayor who controls the entire town, a crooked cop who covers up for the mayor for dirty money, a scoundrel prosecutor who wants to arrest the mayor and the cop, and an ex-rookie cop who used to respect his senior detective but gradually steeped in evil working for the mayor. The exquisite script has surely enabled each character to perform its role successfully. Violence itself may not be so different from Japanese movies but this movie thoroughly depicts conflicts, weakness and foolishness of human beings that led to the point of violence. Good persons do not appear in this movie; not even a single one which is a distinguishing feature of this movie. All the characters are bad, evil against evil, violence vs conspiracy, betrayal vs threat; all those conflicts are sad. But maybe because of the great performance of actors, audience will find themselves at the end of the movie that they are not feeling clouded but rather realize how refreshing entertainment this movie was. The four actors of leading characters play different roles in the movies they were featured. They devote all their energy to act each time, which makes me moved every time and that’s why I don’t get bored. No matter how seriously I explain, I cannot fully transmit my enthusiasm unless you watch this movie. My favorite actors are Hwang Jung-min and Jung Woo-sung. They’ve acted in many other movies and performed in different roles and I’m sure they will continue to, which is why I cannot miss. My words are not good enough. I just want to recommend many of you to watch this movie at the theater. When these days the weather starts to get colder, nothing is as wonderful as having nabe (Japansese hot pot), or a bowl of soba noodles after a long chilling day. Those dishes are not only warm; they are also rich in term of flavor that could ease your stomach and refresh your mind. The secret behind those dishes is dashi, which is Japanese kind of stock that became the main component of many Japanese cuisines. Stock is the basic preparation that is available in any cuisine around the world. Made in the form of flavored liquid, it is necessary for many different dishes, especially soups and sauces. Different countries have different kinds of stocks depending on their available ingredients. The traditional way of making stock is simmering various ingredients in water such as meat, bones, savory vegetables and herbs. Japanese stock, as mentioned above, is called dashi. Dashi is different from the Western stocks according to the way it is made. While Western stocks often take hours of simmering the ingredients to extract the flavor from them, dashi is cooked in a relatively simple way like steeping because the ingredients are already well executed and highly flavorful. There are several different kinds of dashi but the most common ones are kombu dashi, katsuobushi dashi, niboshi dashi and shiitake dashi. Kombu dashi is made by soaking kelp in water. Katsuobushi dashi is made from dried bonito flakes. Niboshi dashi stock is made by pinching off the heads and entrails of small dried sardines, to prevent bitterness, and soaking the rest in water. Lastly, shiitake dashi is cooked from dried shiitake mushrooms. The dashi does not require seasoning like soy sauce because the ingredients contain in themselves the umami, a term to determine the fifth flavor. Umami can be translated as “pleasant savory taste”. It has the root from Japan; the term was identified in 1908 by Japanese chemist Kikunae Ikeda from umai (うまい) “delicious” and mi (味) “taste” attributed to human taste receptors responding to glutamic acid. These days we often find instant or liquid instant dashi in the supermarket that were enhanced by chemical elements to have less subtle flavor. However, the homemade dashi still has its strong position. Each soba shop has its own recipe to combine 3 or 4 types of umami to form their unique dashi taste. Another interesting fact about dashi is that the ingredient could be reused. Leftover katsuobushi can make a stronger dashi that called niban, or secondary dashi. Dried shiitakes used to make shiitake stock can be sliced and added to another dish. Some people say that dashi in Japan is as important as olive oil in Mediterranean food. It is available in several types of dish, from soups to salad dressing. Dashi shows the harmony between complexity and simplicity: complex ingredients execution along with simple cooking technique; complex flavors in simple dishes. Dashi also proves the importance of savory taste in Japanese cuisine. If food is considered an element of one culture, dashi can be defined as a distinctive feature of Japanese culture. With the World Bonsai Convention set to come home to Japan in 2017 for the first time in 28 years, the traditional art form is perfectly positioned for a re-evaluation. While many Japanese people see growing miniature potted plants as a hobby for elderly men, it’s a different story overseas, where all ages enjoy bonsai in ways specific to each place. Industry figures in Japan have high expectations for the eighth world convention, to be held in Saitama from April 27-30, 2017. Rossi, who participated as a panelist in the run-up event of the quadrennial convention, has been engaged in bonsai cultivation for 30 years. The 55-year-old studied at a bonsai school opened by a Japanese in Italy for eight years, and is now teaching 150 students in their teens to their 80s the skills and techniques to grow artistic trees and shrubs. Rossi said he and his students often use rosemary, olive trees and other plants grown in the Mediterranean region to create their works. “My focus is on improving my inner self through the process of growing bonsai,” said Rossi. In the United States and Europe, many young people take care of their own bonsai pieces. Unlike in Japan, those young artists take full advantage of Internet services, such as taking online courses to study how to prune and raise trees, as well as interacting with each other on Facebook. The culture of bonsai cultivation is said to have spread outside Japan after bonsai works went on display during the 1964 Tokyo Olympics and the 1970 Osaka Expo. Artists from the Omiya Bonsai Village in Saitama, which bonsai nurseries formed about 90 years ago, devoted themselves to introducing the Japanese traditional art to other parts of the world. They welcomed many followers and visitors from overseas, and also traveled outside Japan to offer lessons and training. Saburo Kato, who died at age 92 in 2008, was the leading light in the efforts to spread bonsai abroad. His motto of “peace-oriented diplomacy based on bonsai” was embodied by the first World Bonsai Convention, which was held in Omiya (present-day Saitama) in 1989 and drew more than 700 people from 30 countries across the globe. Through demonstrations and workshops, visitors to the convention forged deep connections, as Kato had hoped. Kato had also been looking to establish a center to exhibit bonsai works alongside related documents and materials. His dream eventually came true in 2010, when the Omiya Bonsai Art Museum was opened in Saitama. While only 1,225 people from overseas visited the museum in 2011, the number sharply rose to 4,165 by 2015. Taking his cue from Kato, Hirao has toured more than 30 countries to provide lessons and demonstrations, and finally came up with the idea of performing with disc jockeys and live music at bars and nightclubs. His “bonsai performance” combines the art form with music and alcohol, and has attracted interest from many foreigners who have never viewed bonsai before. In February this year in Tokyo’s Meguro Ward, Hirao performed his first bonsai show in Japan. 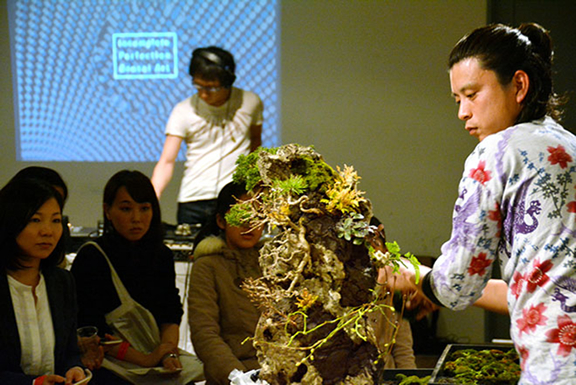 About 80 people–many of them in their 20s and 30s–visited the venue to see Hirao’s performance in which he rhythmically planted trees in hollows in a stone, using soil for horticulture and wires, to music played by a disc jockey. The world convention has been held in the United States, Germany and elsewhere, and will eventually return to Saitama. Kato’s eldest son, Hatsuji, 73, who heads the eighth convention’s executive committee, said he hopes the upcoming event will help boost the popularity of bonsai among the Japanese. Hundreds of brightly colored carp-shaped banners are fluttering in the breeze at two Tokyo landmarks to mark Children’s Day on May 5. The front of the entrance of Tokyo Tower in Minato Ward is adorned with 333 carp streamers, continuing a tradition that began seven years ago to celebrate the national holiday. Event organizers hoisted 333 streamers to symbolically match the 333-meter-tall Tokyo Tower, the capital’s second highest structure after Tokyo Skytree. The event will be held until May 8, with illumination offered between 5:30 p.m. and 11 p.m. 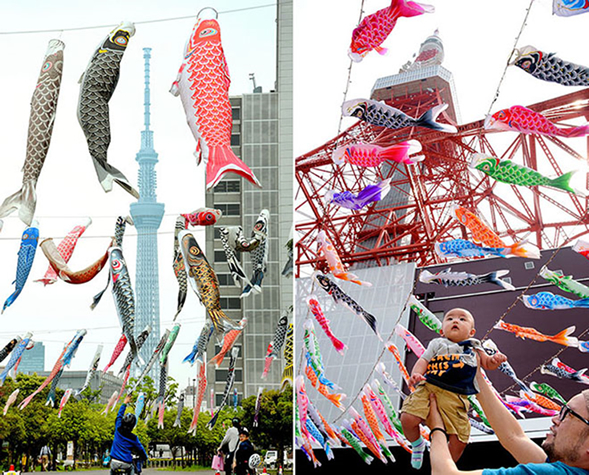 In Sumida Ward, spectators are being dazzled by 450 carp streamers not far from Tokyo Skytree, a tourist attraction that rises 634 meters and opened in 2012. The steamers are located in the Tokyo metropolitan Higashi-Shirahige Park, about 2 kilometers north of Tokyo Skytree. A volunteer organization started the carp banner event about 20 years ago. “We are aiming to come up with 634 carp streamers one day to match the height of Tokyo Skytree,” said Koya Sakai, a 73-year-old representative of the organization. The event will be held through May 20. When one eats may be as important as what one eats. New research at the Weizmann Institute of Science and in Germany, which recently appeared in the Proceedings of the National Academy of Sciences (PNAS), suggests that the cells’ power plants – the mitochondria – are highly regulated by the body’s biological, or circadian, clocks. This may help explain why people who sleep and eat out of phase with their circadian clocks are at higher risk of developing obesity, diabetes and metabolic syndrome. Dr. Adi Neufeld-Cohen, of Asher’s group, in collaboration with Dr. Maria S. Robles and Prof. Matthias Mann of the Max Planck Institute of Biochemistry in Germany, looked for circadian changes in the mitochondria that, by creating peaks and dips in the cells’ energy levels, would also help regulate their day-night cycles. The group identified and quantified hundreds of mitochondrial proteins, finding that the quantities of a whopping 40% peak once a day. Further research identified the proteins making up the mitochondrial circadian clock that regulates these activities. Surprisingly, most of the circadian proteins in the mitochondria peaked four hours into the daylight part of the cycle (in mice, which are active at night). Among the essential proteins the researchers uncovered was a key enzyme that determines the rate of sugar use for energy production. This protein reaches its maximal amount four hours into daylight, suggesting that the mitochondria’s capacity for burning sugar peaks around this time, as well. To check, the researchers provided mitochondria with sugar and found that at around hour four, respiration and glucose utilization were indeed at their highest. They also found that the protein responsible for the entry of fatty acids into the mitochondria only peaks at the eighteenth hour and, again, tests showed fat processing was optimal at the same time.